Leg cramps, (sometimes also referred to as charlie horse) can be painful and occur at any time throughout the day. Normally occurring in calf muscles, these problematic pains are also known to affect other parts of the leg including feet and thighs. Leg cramps are far more common at night with some statistics showing that 3 out of 4 cases happen between the hours of 9pm-7am. During leg cramps the affected muscle will tighten dramatically leaving you with little or no control over the limb. These muscle spasms tend to last for around 10 seconds but in some cases the contractions can last up to 10 minutes. There are various reasons why you may suffer from leg cramps. These range from over-exercise to the side effects of medication. However, the most common cause of these disabling pains is due to a deficiency of the minerals potassium and magnesium within the body. When our bodies are deficient in these key minerals our muscles fail to function or relax properly leaving them far more likely to spasm. As it happens, both the potassium and the magnesium needed to replenish your body's supply can be found readily available in apple cider vinegar. During its two fermentation processes, apple cider vinegar transforms from a simple apple juice to a rich enzyme filled tonic able to offer a huge range of health benefits. Tired of waking up to painful leg cramps every night? This one simple method is a sure fire way to eliminate these problematic cramps from your life for good. Warm some water in a pan, being sure to bring to the boil. Add some raw honey and stir until dissolved. Once cooled, add this to an 8 ounce glass and add two tablespoons of raw cider vinegar. Drink this first thing in the morning and last thing at night to keep your muscles in constant supply of these much needed minerals. 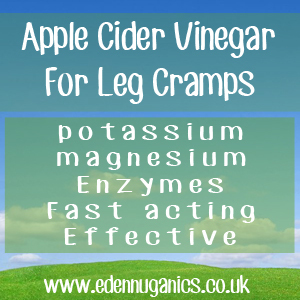 As well as drinking apple cider vinegar, the benefits of this brew also extend to topical use. The best method to treat leg cramps topically is to soak a flannel in warm apple cider vinegar and apply it to the affected muscle. This should offer instant relief from the pain and help to stop it returning in the future. Ice - One of the best ways to instantly relieve the pain associated with leg cramps is by applying ice to the problem area, this also helps to relax the muscles and reduce future spasms. Bananas - Like apple cider vinegar, bananas are also an excellent source of easily absorbed potassium. Simply eating one or two bananas a day could be enough to stop leg cramps altogether.